Sometimes plumbing is driven by a move or expansion. Sometimes it's driven by a break, a leak, an emergency. But always, always, it is driven by the need to have the job done right the first time at a fair price. A.J. Michaels can handle your business’ plumbing needs. Anything from a clogged pipe to a certified backflow valve; from a water heater to radiant floor heating. Anywhere in the central Maryland area – whether it’s a sink, faucet, toilet, sump pump or a blocked or broken pipe. It can be anything from a leaky faucet to a broken pipe at 3:00 AM. It doesn’t matter. A.J. Michaels will repair or replace it. No matter what kind of building you may have – or how old it may be – our expert plumbers can repair, replace or install whatever you need. How experienced are our plumbers? 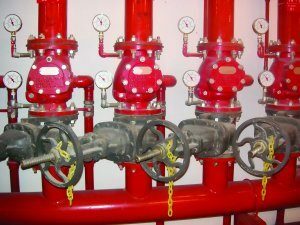 We’ve had plumbing equipment manufacturers call us to solve problems that they couldn’t. We specialize in the most complex systems, even in historic structures. And if your plumbing problem is a symptom of something more serious, we’ll let you know – so you can do something about it before it becomes an emergency.